VentureWell and the Learning Spaces Collaboratory have a long history of orchestrating conversations about learning spaces in the service of nurturing the creativity and entrepreneurial spirit of today’s students to become the innovators of the future. A 2009 Seminar. 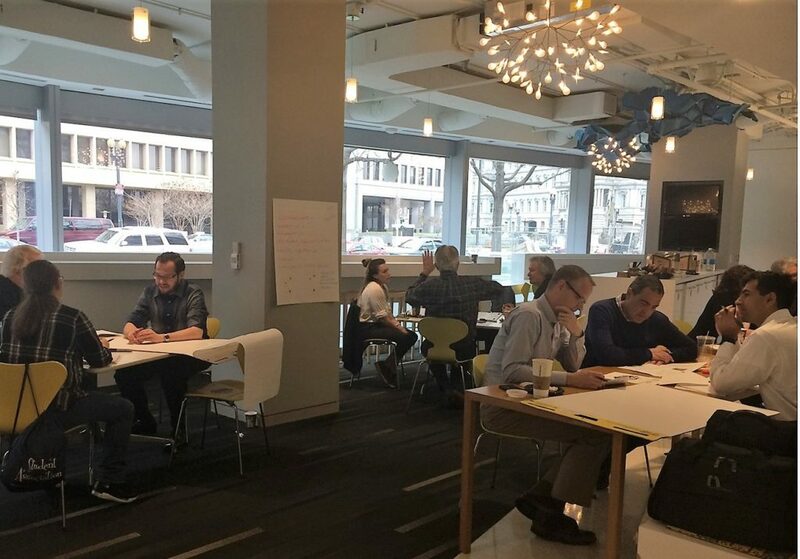 Sparked by the Lemelson Report on Places of Invention and hosted in DC by Herman Miller, a diverse group of academics and architects shared emerging questions and best practices in realizing spaces that called for risk-taking by planners and by users. This seminar validated findings from the report of the power of place and how communities, whether large or small, play an important role in shaping spaces of invention. The description of spaces that work from the Lemelson Report could be adapted as a template for assessing a space as a place for invention. A 2015 Post-Conference Workshop. This day-long workshop, appropriately held in a DC-based innovation hub, anticipated the later LSC Roundtables in its intent and format. A 2017 Post-Conference Roundtable in which architects and academics made the case for new kinds of questions to be asked in the process of shaping spaces for making. Participants in this 2018 “broadening the discussion” VentureWell/Learning Spaces Collaboratory roundtable will bring their individual experiences as academics and design professionals to address audacious questions about the future of spaces for making. These discussions will be sparked by questions emerging from the 2016 VW/LSC roundtable on spaces for making. The discussion will be enriched by the diverse perspectives that participants bring to the roundtable. As with all LSC roundtables, there is a flow through the discussions, something like a Mobius strip, of back and forth between common conversation and small working groups, with show and tell along the way. A set of papers will be drafted, outlining rationale and strategies for establishing a vision and goals for a campus as an ecosystem of spaces for making and identifying initial steps toward that end.